When Michael Labell was growing up in Newton, NH, his dream was to play for the Boston Red Sox. But when he realized, as a freshman playing JV ball at Sanborn Regional High School in Kingston, that scouts were not likely to flock to see him play, he reflected on what could be a more likely career. The son of a police officer, he decided on law enforcement. 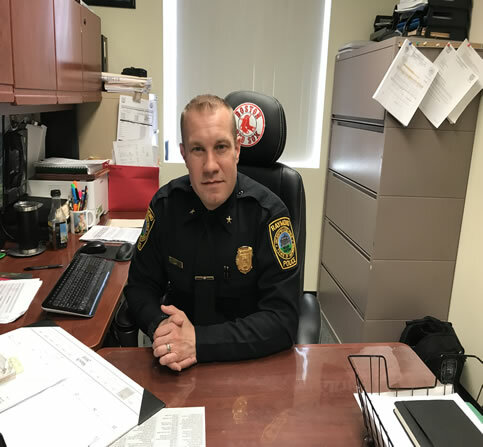 In March, in his 19th year with the Raymond Police Department, Labell was named police chief for the Town of Raymond, following the retirement of Chief David Salois. 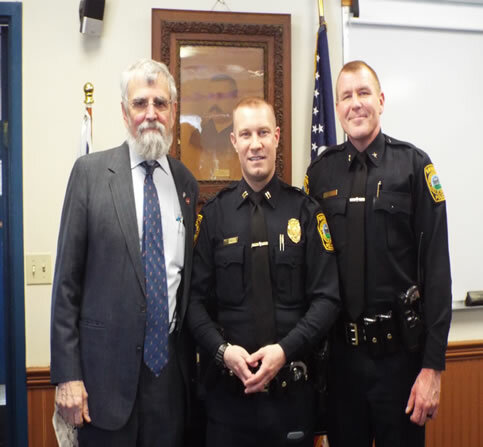 Town Manager Craig Wheeler, incoming Chief Mike Labell, retired Chief David Salois. 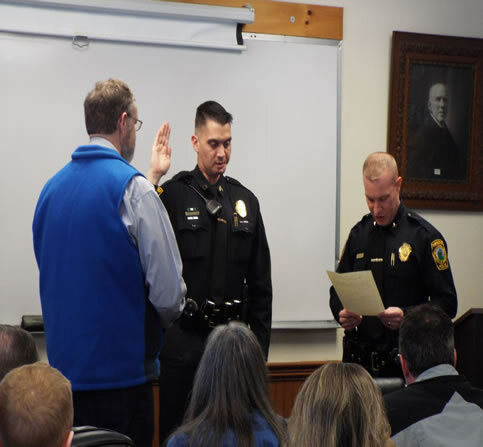 Labell was hired Sept. 22, 1999 as a patrol officer in Raymond when he was 20, and Salois was hired as police chief not long afterward while Labell was at the police academy. 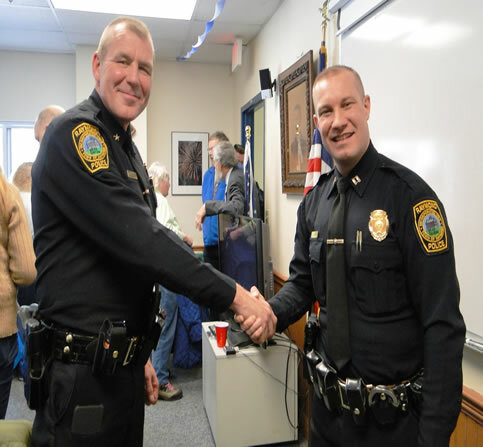 That began a professional relationship between the two officers, and Labell said he is proud to say that Raymond is the only police department where he has ever worked. “Chief Salois was an outstanding chief and a great mentor to me,” Labell said. 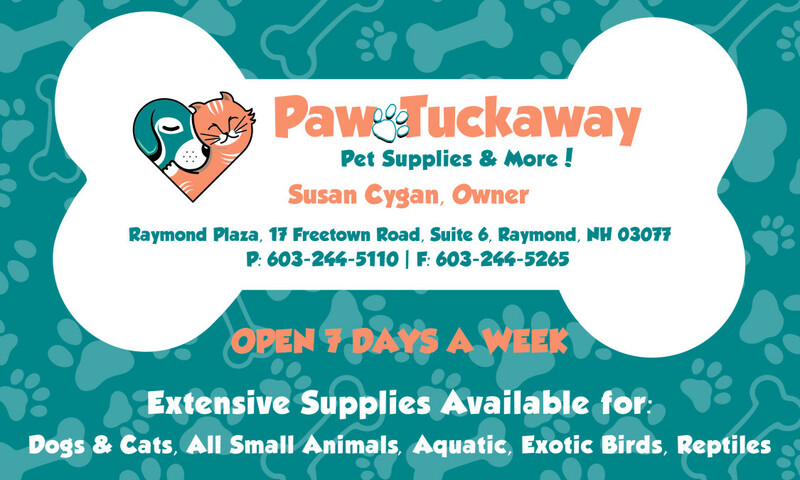 “He did great things for the Raymond Police Department and the Town of Raymond. I’m lucky to have been” able to work under him for 18 years. Retiring Chief Salois congratulating the incoming Chief Labell. A bond measure to expand the station at its current location was defeated in the March 2017 election and did not appear on the March 2018 warrant. Including the chief, Raymond has 17 full-time and five part-time officers. Chief Labell's Dad, Rick Labell, pinning the Chief's Badge on. 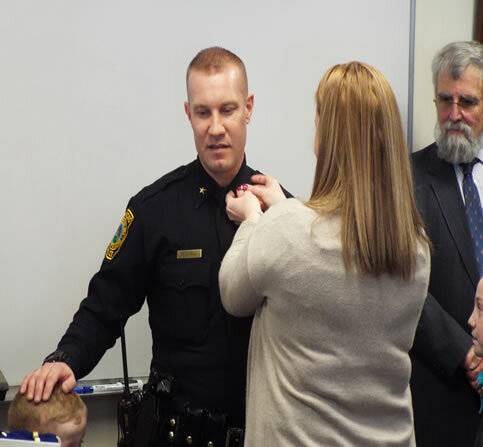 Chief Labell's wife, Karrie Labell, pinning the Collar Brass Stars on. Labell said he will not be filling the police captain position that he vacated, but will keep it in the budget. 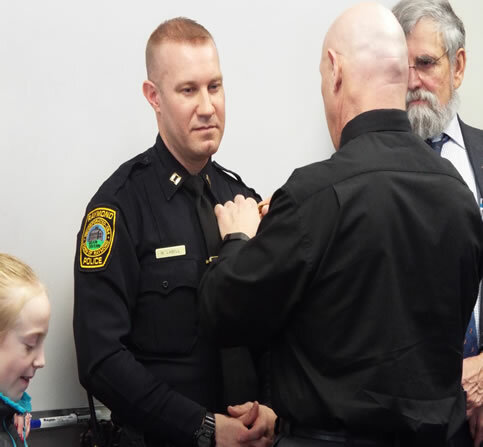 Instead, Chad Shevlin has been promoted from sergeant to lieutenant, a position that had been keep vacant when Labell became captain – the first-ever captain in the Raymond Police Department – in 2016. He said it is important to keep the vacant position to encourage officers to strive to move up the career ladder. Labell is now hiring for a corporal position; the person hired will be a shift supervisor, the first line of supervision. Swearing in Chad Shevlin as the new Lieutenant. “The evidence room move is still going to happen, but we’re exploring other options with the Public Works Department,” Labell added, referring to plans to move the evidence room to storage containers in the parking lot. Money has been encumbered from last year’s budget so work can take place this coming summer. Any change made to the plan will be done within the established budget, he emphasized. 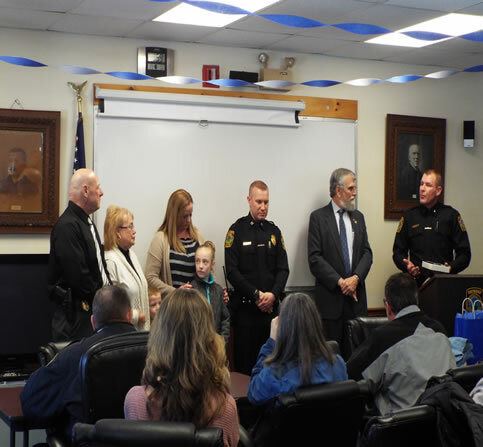 Labell’s father, Rick Labell, is a detective for the Raymond Police, and the new chief points out proudly that he’s worked in Raymond longer than his father has. The senior Labell spent most of his career in Newton, where he was police chief. He was hired in Raymond in 2004. Labell will not be supervising his father, nor has he ever had to do so, noting there are well-established layers of supervision in place. “I’m very proud that my dad was a chief – he was definitely a role model and a mentor to me,” he said. Labell recalled that his father would sometimes take him along in his cruiser, and they would talk about his day’s work when his shift was over. “I’m lucky that from about the time I was 14, I decided law enforcement was what I wanted to do, and I knew that meant I had to stay out of trouble,” he said. Asked about national proposals to arm teachers in an effort to address school shootings, Labell said he did not think arming teachers is a “safe option. “As police officers, we go through a lot of training and certification to be armed, and I don’t know that an educator goes into that profession with the thought in mind of being armed,” he explained. 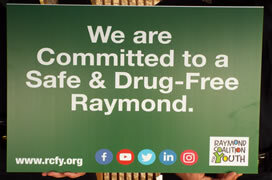 “I don’t think it’s the safest idea.” Labell noted that Raymond has an armed School Resource Officer who visits all three of the Town’s schools. Labell lives in Danville with his wife, Karrie, and their children – stepson Jeffrey, 19, currently serving with the Air Force in Dover, Del. ; a daughter, Jaiden, 8; and son Jacob, 3. Asked about his spare time, Labell said it’s spent with his family, including attendance at his daughter’s gymnastics meets. Chief Labell’s parents, wife and children by his side.